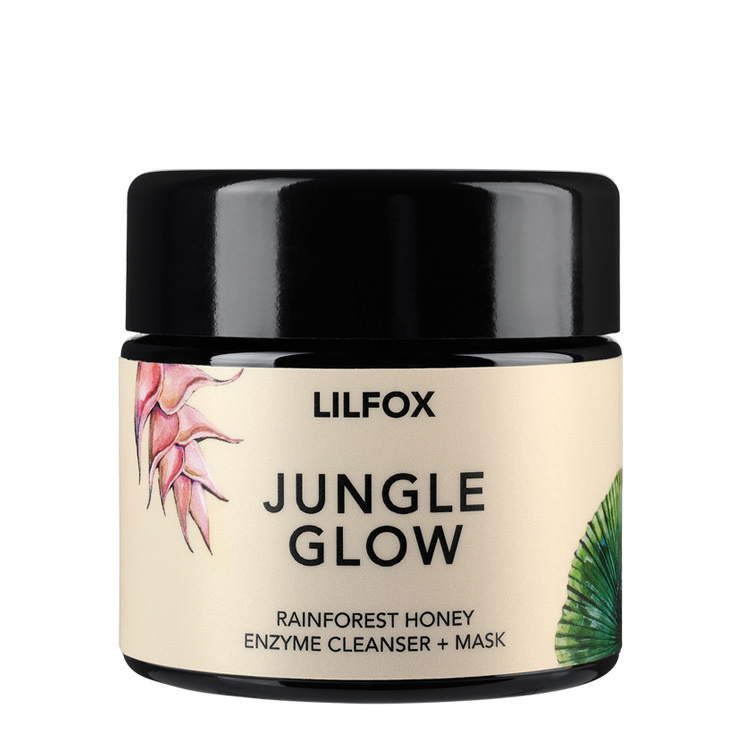 The Jungle Glow Enzyme Cleanser and Mask by LILFOX offers a feeling of the exotic, while leaving skin looking smooth and illuminated with natural honey enzymes from Hawaii's Rainforest. 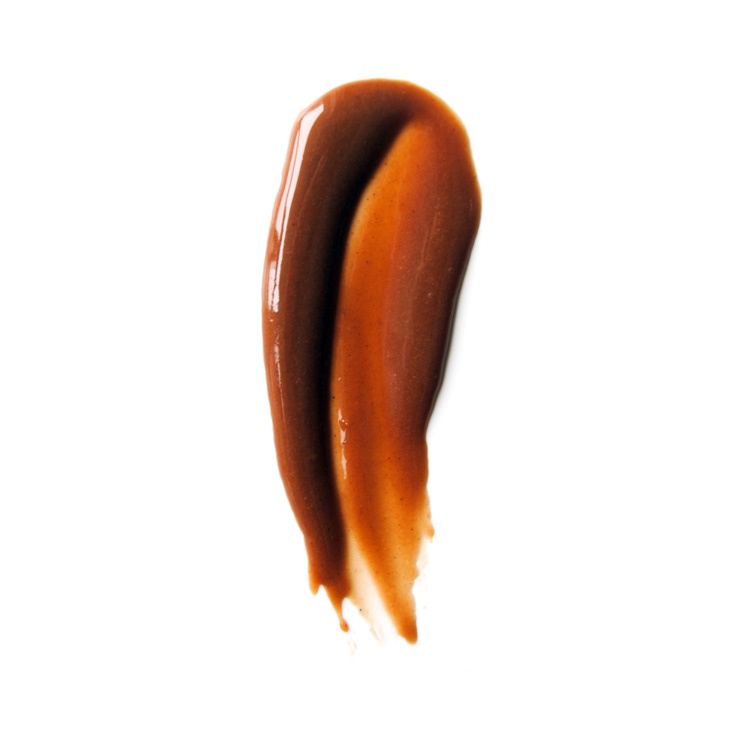 Antioxidant-rich organic raw cacao, organic rosehip oil and maracuja oil are infused into the honey base to give skin a plumped and moisturized effect. Mineral-rich Amazonian white clay gently lends a softening quality while cleansing the skin. Pink grapefruit, vanilla, neroli and bitter orange harmonize for a uniquely addictive aromatic profile, a trademark feature of LILFOX. Dripping with nature's most decadent ingredients, LILFOX transports us to a time when beauty ritual was a precious artform. Drawing from a palette of luscious plant materials like maracuja oil, raw Hawaiian rainforest honey and Amazonian white clay, Jungle Glow is a magical cleansing balm that makes skin feel super soft, leaving behind a smooth, bright appearance. As a cleanser, apply a small amount to damp skin for 1-5 minutes. May massage before rinsing to make skin feel extra smooth. Rinse with water. To give skin a richly hydrating feel, apply as a mask to clean damp skin and leave on 5-30 minutes. (May also be mixed with a clay mask if desired.) To improve the feel of skin clarity and texture, massage before rinsing with cool water. A facial in the shower? Sure. When I feel like a morning treat and my face is in need of some plumping, I use this mask as a cleanser/mask combo in the shower. Not only are my senses delighted, I start the day with a glow. I like this mask very much! . I am using it after Cleopatra mask while I am taking a shower . After both masks I have plumped, soft and fresh skin. For person with dry, sensitive or mature skin I advise used both masks while you are taking a shower or bath. Be wonderful! I hate scrubs, but I really like this. At first, I didn't think I would like this much. A lot about the product seemed to be just "too much." Abrasive, sticky, a deep, earthy fragrance--all these things together seemed overwhelming. But then I tried it. And I liked it. I tried it a second time, and it seemed much more approachable, and I loved the experience and the effect it had on my skin. I generally use it as a combination second cleanse and mask in the PM. It's a nice little ritual. I tend to remove it very gently because scrubs are too abrasive for my sensitive skin. I only scrub it on my forehead, jaw, and neck. Even so, the glow it leaves on the skin is undeniable. I'm not sure if I'll repurchase, but it has turned me on to the Lilfox brand. Its totally fine to floss and mask at the same time, right? It's literally sweet if you accidentally taste it. I have it on right now, mixed with a few drops of my essence and Cleopatra mask. It's a very clarifying/hydrating mask, but for me, a bit too abrasive for a facial wash. Smells beautiful and leaves a dewy glow afterwards! So happy I received this as the April hero box! PS Great tip from the other reviewer to use on damp skin too.